Using nautical charts of the areas, Coast Survey provided a range of possible sites that helped port officials narrow their anchorage options. After navigation manager Tim Osborn worked with the officials, and with additional requirements in hand, Coast Survey cartographic expert Steve Soherr provided a digital graphic showing likely areas, with information that guards against pipeline and platform interference with safe anchorage. 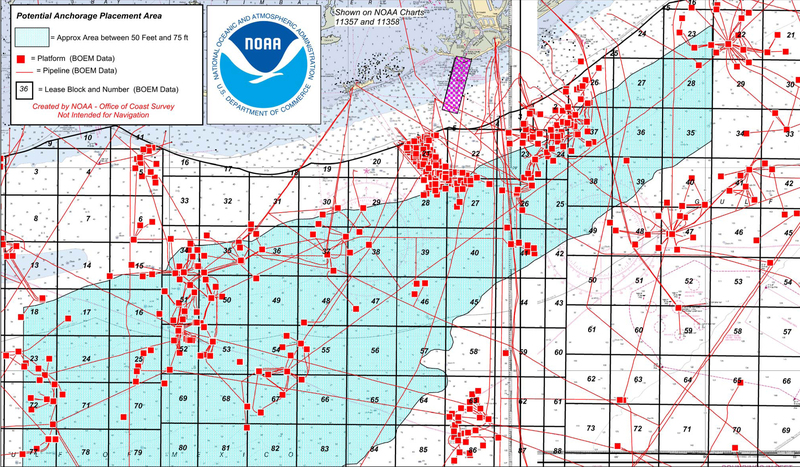 As additional safeguards, hydrographic surveys will likely be needed to confirm that the seafloor of the recommended areas are free of hazards and do not have uncharted pipelines. Coast Survey will work with the Department of Interior’s Bureau of Ocean Energy Management and Bureau of Safety and Environmental Enforcement as needed. The port will bring its recommendations to the U.S. Coast Guard, who has the authority to designate the anchorages. Cartographic adviser Steve Soherr, with Coast Survey’s Navigation Services Division, produced this graphic showing the lease blocks, pipelines, and platforms offshore of Fourchon and Belle Pass. Port officials and others will use the image to examine areas offshore that are both free of pipeline hazards and within the depth range required to accommodate offshore service vessels and the other fleets seen at Fourchon.